The best older horses of the west coast met up at Del Mar for the Grade 1 Pacific Classic on Sunday. A field of eleven went to post in this $1 million event at 1 1/4 miles on the main track. Hollywood Gold Cup winner Lava Man was sent off as the 3-2 favorite over 9-2 second choice Perfect Drift, winner of the Washington Park Handicap last time out. When the gate opened, jockey Pat Valenzuela sent the favorite to the front saving ground on the rail, with 5-1 third choice Surf Cat rushed up to dispute the pace just to his outside. The pair set brisk fractions of 22.68, 45.90, 1:10.35, and 1:35.35. Turning for home, Lava Man surged ahead as Surf Cat dropped out of contention, and with a furlong to go, appeared to be home free with a comfortable 2 1/2 length lead. However, 11-1 shot Borrego and second choice Perfect Drift, who had raced well back early, were rallying strongly down the center of the track. With the tiring Lava Man shortening his stride, Borrego got to the line 1/2 a length ahead of Perfect Drift, who just caught the favorite for second. It was just a head back from Lava Man to 6-1 shot Choctaw Nation in third. The final time was 2:00.71 for the 10-furlong feature. Lava Man had to be vanned off after the race due to heat exhaustion but is expected to recover fully. Jockey Garrett Gomez, celebrating his third Pacific Classic win, said, "He ran really good. I have so much confidence in this horse. I knew it was just a matter of time before he broke through and put the icing on the cake for us. I got the trip I wanted. He was running good for me all the way. And I got some help coming home. When Choctaw (Nation) came up outside of me, my horse just dug in and tried harder. He's run with them all." A much smaller group of older horses met at Saratoga for the Grade 2 Saratoga Breeders' Cup Handicap. Only five horses faced the starter in this $250,000 mile and a quarter event, with Offlee Wild sent off as the 3-5 favorite. 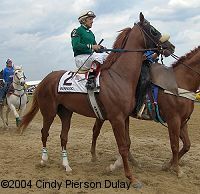 However, the heavy favorite added to the reputation of The Spa as the graveyard of favorites with his last place showing, being bumped at the start, wide throughout, and tiring through the stretch. 3-1 second choice Suave, involved in the early bump with the favorite, recovered well, grabbed the lead after 1/2 a mile in a slow 48.25, and, slowing the pace further through 6 furlongs in 1:12.14 and a mile in 1:36.94, had plenty left in the tank to surge ahead through the lane to win by 2 3/4 lengths over 14-1 longest shot Royal Assault in a time of 2:03.38. Winning trainer Paul McGee said, "He's had a quarter crack in his back foot that has been bugging him all year. As you can see, it is all fixed now. I think he felt those horses coming to him, and he responded. My first thought was that he didn't like Saratoga, but he was doing so good and we had a couple of reasons to throw out the Travers last year, we thought we would try." Winning jockey John Velazquez said, "He makes you work. He was a handful in the gate, and he stumbled a little bit from there. I just wanted to get him in good position going into the first turn. He settled nicely and was by himself." 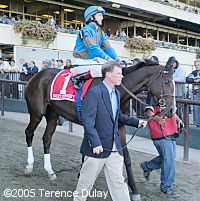 The New York Triple Tiara series concluded with the Grade 1 Alabama Stakes at Saratoga at 1 1/4 miles. Seven 3-year-old fillies went to post for the $750,000 purse, but Smuggler, who won the first two parts of the Tiara, had to miss the race due to a fever that put her training behind schedule. 4-1 second choice Sweet Symphony was unhurried early, and then jockey Jerry Bailey sent her wide around the far turn for her rally. Out in the 3 path she closed strongly through the lane and drew away to a 6 1/4 length win over 8-5 favorite Spun Sugar, who stalked the early pace in second early but could not issue any challenge to the winner when asked. The final time was 2:04.45 over the good main track. Winning trainer Bill Mott said, "They went slower than I expected them to go, and it looked like there was some crowding going into the first turn. Because of that, I think Jerry (Bailey) was farther back. But he let her cruise up there. When she left the three-eighths pole, it looked like Jerry had enough horse, if she was good enough. I like this filly a lot. She's done everything we've asked and done everything right. She always has more for you." 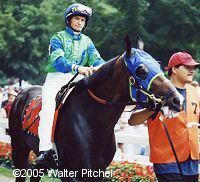 Mott indicated that she would make one prep race at Belmont Park in preparation for the Breeders' Cup Distaff.